Before meeting up with Phil on that last stretch, I’d been contemplating what my plan was once I got back to the control. The B&B was only a few kilometres away, but it may as well have been on the moon. There was no way I fancied riding any further, especially uphill along more dark lanes. I’d pretty much decided that even though there was a comfy bed with soft pillows waiting, I’d just have to crash for a couple of hours at the control to recover. There was nothing appealing about poor sleep on another squeaky mattress on the floor though. Phil came to the rescue, or rather his wife did – since it was her now driving us to our respective homes, our bikes lashed to the bike rack and bags dumped in the car. I suspect she may have regretted it though, although she didn’t say anything. It seemed much further away than I’d remembered, or the “it’s only a couple of Ks” I’d given by way of re-assurance. Plus my brain had gone absent in my hyper exhausted state, and I kept trying to divert her left at every turn we came too. Luckily Phil had a much better grasp on reality, remembering the way from that first leg five days ago, and pretty soon they realised that the best plan was to ignore any directions I tried to offer. Before long we came to the pub, and bike, bags and myself were dropped safely off. It’s hard to express the relief I felt knowing a real bed was waiting. I had totally forgotten to give Jane the courtesy call I’d promised with a rough arrival time, but I did remember where she said the key would be. Neither of these mattered though, she’d heard the car pull up and leaned out of an upstairs window with a friendly greeting and confirmation my room was all ready. I forget the exact sequence of events after that. In some order though, I rolled the bike into the garage as quietly as I could, remembering that Michael and Kerri-Anne would be asleep upstairs; dumped bags in my room, and put the kettle and toaster on. Although dog tired, I was also starving and I knew my body needed food before it was allowed to sleep. Jane popped across in slippers and dressing gown to check I was OK – she seemed pleased and a little amazed that I had made it. I apologised for the forgotten call, but she didn’t seem at all bothered. Jane also said sorry to me, but in her case it was because she couldn’t let me have lie-in in the morning – she needed to get the room cleaned and ready for another guest. I explained that I had a flight to catch, and would need to get myself sorted for it anyway. I retired to my room with a big mug of hot sweet tea in one hand, and a plate loaded with two slices of toast smothered in butter, one with Marmite and one with marmalade. It was such a luxury to relax off the bike, able to eat and drink. I couldn’t immediately pinpoint what it was that made it so special, and then I realised – there was no sound of that clock ticking. It had been silenced. I had silenced it. I could take as long as I liked to eat, and it didn’t matter any more. Heck, I could even have a shower. Which, smelling something like an open sewer, is exactly what I did once I’d finished eating. It would have been sacrilege to defile the plush, comfy white sheets and pillows in my shabby state. Looking around the room, there was clearly nothing which couldn’t wait until morning, so I set an alarm for I think around 7:30am, turned the light out, and slid down under the covers. I’d imagined I would be asleep the moment my head hit the pillows but I wasn’t. For the 115 hours of my LEL, my knees had not given me a single issue, nothing more than the slightest of aches, and not even that really after the first day or so. But now they complained at full volume. The sharpness of the pain took my breath away, totally eclipsing the soreness of my neck. It was like someone had lit a blow torch under the back of each knee cap. It seemed that there must have been some trouble in there after all, but I guess my mind had been shutting it out. With the release of the ride being over, the pain found it’s way to the surface too. I got back up and took an Ibuprofen. And then at last, the sleep came. I’m not totally sure whether the alarm woke me, or it was the sound of my phone. It took me a few moments to find and answer it, and as I did my head was dull with sleep. “Well done, you did it.” said a female voice at the end of the phone. “I don’t want to hear about it by phone, I want you to tell me about it, get dressed and get downstairs“, and the voice hung up. I was struggling to piece it together. Yoli had threatened to fly over if I’d made it. But why had she slept in a different room last night, why hadn’t she just used the room I’d booked? It was no good, my brain couldn’t unravel it so I called her back. “Hold on” I said. My mistake dawned on me, and I quickly looked at the call log on my phone. The female voice wasn’t Yoli, it was Emmerentia. The pieces all fell into place, and laughing, I explained it all to Yoli. “Sorry I couldn’t make it over. Go get some breakfast, and tell your friends about the ride. Then get packed and come home.” Yoli said as our call ended. I quickly showered, got dressed, and wandered the handful of steps from my room, through the sitting area, to the breakfast room. I think Micheal and Kerri-Anne were there already and the first to congratulate me, and me them – although the latter seemed something of a formality. I don’t think their finishing the ride was ever really in any doubt. Soon after, Emmerentia came downstairs, and with a big smile and a hug passed on her congratulations too. I think she said something along the lines of “Amazing effort” and also words to the effect that they’d been worried about me and weren’t sure I would make it. Over coffee, muesli and pastries we rapidly swapped stories and anecdotes from our rides. We’d swapped SMS on the first day or two, but had lost contact after Emmerentia’s last message saying they were at Edinburgh. It turned out that was as long as her phone had lasted. She had managed to stay with the German guys she had left St Ives with all the way around. One of them had been faster than her, and the other slower. This had allowed Emmerentia the luxury of riding at her own pace up the hills, comfortable in the knowledge they’d regroup at the top and not leave her behind. I forget what time she said they’d finished, but I think it was around 4pm the previous afternoon – she had managed what I had failed, to be back in time for a beer before closing time. Not that it mattered really, a beer would have knocked me out cold anyhow. Breakfast over, I quickly organised a taxi to the company’s office whilst I repacked my rucksack. It was a massive relief after trying a couple of firms to find one with an estate car big enough to take the bike. I’ve still no idea what deranged state of mind I must have been in to think I’d want to ride through rush hour traffic wearing a heavy backpack just a few hours after finishing a 1,400km ride. Luckily I wasn’t going to have too. Wheeling my bike out of the garage it was time to say goodbye to Emmerentia, Michael, and Kerri-Anne and to bid farewell to Bell Common and the Forest Gate pub – the start and end of my great adventure. The rain didn’t stop all the way back into central London, and the traffic was heavy. So heavy in fact, that I started to stress about how much I still had left to do before my taxi arrived to the airport. Eventually the car wound it’s way through the jams and deposited me, bike, rucksack and bags onto the pavement outside our office on Mansell Street. I couldn’t resist looking across the road to the bus lane where six days ago I had started out, wobbling and cursing the lock that hadn’t actually made it beyond the first ten meters of the ride. It brought a smile as Justin came up the outside steps and grabbed several of the bags from me. In fact, I think he may have carried the bike down as well. Scattered across the floor of the office was an assortment of muddy and oily bike parts, spread on top of several sheets of flipchart paper to protect the carpet. My lurid green bikebox was standing open expectantly, as was my suitcase. And on top of one of the desks was a large box full of various bike components and other miscellanea which I’d opted not to take on the ride and had stayed in the office. Surrounded by all the bits and pieces I was suddenly rather tired and overwhelmed. I couldn’t quite get my thoughts straight on what to do next. What I did next was head to the kitchen and drain the last of the coffee pot Justin had kindly put on for me. I needed a shot to help get me grounded, ready for one last push to get me on my way home. The caffeine did the trick, and the various parts of the disassembled bike were soon firmly strapped in their respective places in the box. I was quite surprised that pretty much the contents of both drop bags also fitted in the various remaining open spaces. It was almost as much a surprise as how bad some of them smelt – a strong whiff of ammonia came from a slight opening at the top of one of the clear plastic bags of clothes. I guessed it must have been the first set I had changed in Market Rasen on the way north. I sealed it tight before stuffing it in a gap in the central diamond of the frame, hoping that the airport security dogs didn’t take an interest in it. Wasn’t anhydrous ammonia one of the ingredients for cooking up tik? I hoped I’d remembered my CSI episodes wrong. It’s surprisingly how quickly two and a half hours passed, but I’d barely returned from the Tesco opposite the office with food than my airport taxi arrived, and I was wheeling bike box and case to where the car was parked a hundred meters up the road. It felt a little rude stuffing my face full of food in a smart, clean executive car. I did it all the same. It felt like I would be eating for a week to catchup the energy I’d used. It felt like I’d need to sleep that long too, if not longer. I hadn’t really been following the driver’s route, but we ended up in Parliament Square passing Big Ben, the houses or parliament and Westminster Abbey. The clouds from earlier gone, it was now a beautiful summers day and tourists were everywhere enjoying the sights.. Perhaps it was the thought that the riders who had done the prologue came this way, I’m not sure, but it all suddenly caught up with me. I found myself staring out of the window, a lump in my throat and tears starting to roll down my cheek. I’d done it. A year ago Yoli and I had sat in a restaurant and agreed I was going to give it a try, with the goal of at least getting to Edinburgh to help me decide if PBP was possible. A week ago I’d stared out across East London, literally looking out over my riding route to registration. 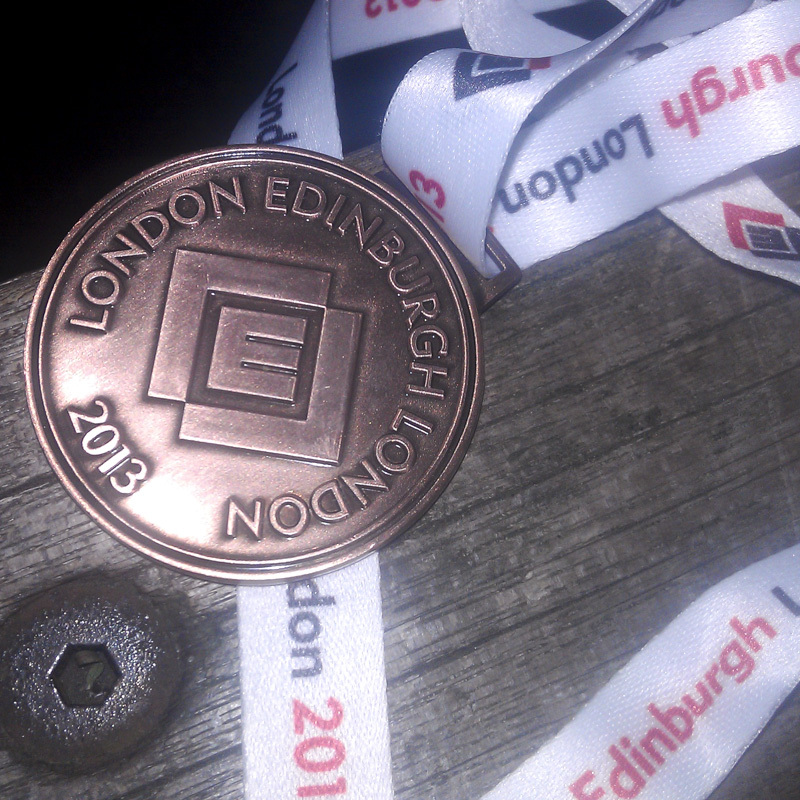 And here I was, on my way home, with a finishers medal in my rucksack. It didn’t seem possible. I’d never really believed I was going to complete the ride, but somehow I had. Fortunately the tourists thronging the pavement were far too interested in their sightseeing to wonder why some guy in a smart executive car was driving pass blubbing his eyes out. The journey to the airport was uneventful, and as hoped I got there massively early. It was always my plan. I wanted some time to pick up gifts for Yoli and Ben, and was more than happy to wile away a couple of hours in the lounge once that was done. I did warn the airline staff exactly where I was though, and asked them to send someone to make sure I hadn’t fallen asleep when the flight was called. As it happened, catching up on Facebook kept me more than occupied until the flight was called. Yoli hadn’t exaggerated the amazing level of support, and it took quite a while to respond to all of the messages. Finally, before I headed towards the gate I posted a quick status message for everyone I hadn’t responded to individually. The tears came, eventually, but not until I was sitting alone in the taxi to the airport and it really sank in. Up until that point it was all just excitement, fatigue, and rushing to get a filthy bike packed up for journey back. They came again too, just now, sitting in the lounge reading all your amazing posts. Yoli had already told me what tremendous support and encouragement you guys had given, but nothing could have prepared me for reading through them all. It was a truly amazing experience, and it’s wonderful to realise you were all there with me. At times it was pretty much the only thing keeping the pedals turning, especially on that last hot, tough and slow day. A massive thank you to to everyone for being there and helping me to the finish – with all of you behind me, quitting just wasn’t an option! PS – I will of course write up some proper notes in due course, but I have no idea how to summarize them down into anything that won’t take almost as long to read as it took to ride! As it happened, the flight was very delayed, and although I didn’t actually fall asleep in the lounge, I was out cold before we’d left the tarmac. The plane flew through the night. I slept the whole way, and was barely awake when the screech of tires announced our arrival. The moment I was through customs and the sliding doors to the Arrivals hall opened, there they were. 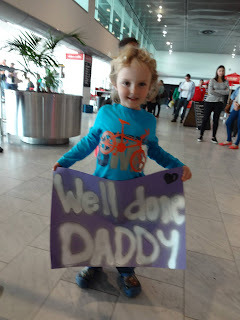 Ben was waving a wonderful sign he had made, which got dropped as soon as he saw me and ran up to give me the biggest of hugs. Yoli wasn’t far behind. My welcoming party also included Henri Meier too, who’d come with his son to meet the flight and deliver a hefty “well done” hug in person. It was a wonderful thought – Henri and Penny had been absolute rocks during my training. I wouldn’t have been nearly ready without them, and finishing LEL was as much their success as mine. Penny had also wanted to be there, but the arrival clashed with family commitments. She was their in spirit though too. In a flash, the arrivals moment was gone, and we were on familiar roads home, excitedly chattering about the events of the ride. We also agreed to throw a thank you braai for friends and club mates on the following Friday, which conveniently was a pubic holiday. The bike has been re-assembled, albeit now largely stripped of the weight of audax paraphernalia. The dynamo wiring and handlebar bag remain for now. I think I’ve figured what may have gone wrong in my electrical system, and have ordered the official eWerk cache battery. I’d shied away from this originally because of it’s low storage capacity and high price, but that now seems like a mistake. Luckily also, Star Bike had it on special at not much above half price too. Once I’ve tested out the setup, the last vestiges of LEL will be packed away for a while. At this point however, there is one question which remains unanswered. What about PBP? LEL was originally intended purely as a test event for PBP. Along the way though, it became it’s own challenge – a terrific adventure that massively exceeded anything I had imagined for it. And I’d be lying if I said that managing to complete LEL hadn’t slightly taken the edge off the physical challenge aspect of PBP. I know PBP is a tough event though, so I know there would be no shortage of challenge. So what about PBP then? The passion is still there. The prospect of taking part in the oldest bike ride in the world and savouring that amazing atmosphere still inspires me. And I think, it inspires me enough to go through all of that again – the training week in week out, and the cold and dark 5am starts for long rides that don’t end until it is cold and dark again. The only fly in the ointment is my body. I’ve been back on the bike once in the last three weeks, for a 140km DC training ride. It nearly killed me – my knees ached, and my neck pain was back in full flood by the end of the ride. I’ve had massages and physio on my neck, and just been signed off from riding for ten more days to give it a chance to heal. And that’s not to mention the more minor ailments, my fingers are still somewhat numb and tingly. My toes are partially numb too, and also seem to be on fire at times, possibly some lingering effect from the freezing they got descending Yad Moss before dawn. Recovery from the exertion is slow and painful, which does raise doubts. My mind may be up for another long audax, but will my body cope? Only time will tell I guess. The immediate focus is to get back on the bike and get out there enjoying my riding again. PBP can wait. Decisions about PBP can wait. That’s a future chapter, maybe. For now, LEL is done, aside from the memories. Memories which come back to me all the time, moments that it’s still hard to believe I experienced for myself. Did I really ride all of that way? Did the bike myself and William had built really cover all of those kilometers without so much as a puncture? Surely no one can ride to Edinburgh and back, at least not an almost 49 year old who only started riding a few years back. Crazy. Madness. It must have been someone else who did it. Or maybe it was just a dream.